Formula of Betaine Hydrochloride, Pepsin, Pancreatin, Bile Salts, Papain and Bromelain. Helps digestion when hydrochloric acid levels are low. Enzyme Plus - a powerful enzyme formula for assisting with the process of digestion. It’s really hard for our bodies to digest all the hyper-processed “foods” we so commonly eat. Our bodies can’t keep up with all the modern innovations in food. The result? Indigestion - from not eating the right combination of natural, nutrient-rich foods. The term “acid indigestion” is actually a misnomer, because a condition of excess acid in the stomach is rarely the problem. Indigestion occurs because the food is overcooked and highly processed. Eating this poor quality food makes the body have to work harder to digest it. If the person has a low hydrochloric acid secretion, as many elderly people do, it may take several hours for digestion to reach the stage where the stomach is ready to send the food on to the small intestine. Because of this extended time in the stomach, fermentation occurs and gives off the typical by-product of gas, causing bloating and belching. When this happens, the last thing a person needs is an antacid. What is actually needed is more hydrochloric acid and pepsin so that food can be digested properly. If you eat a high-fat meal that takes considerably longer to digest, you require emulsifiers contained in bile from the liver to help the enzyme lipase break down fat. If the liver is at all sluggish or the bile is too thick, this can produce a variety of digestive problems. That’s when you need enzymes to speed up digestion and protect the digestive tract from the irritation caused by gastric distress. 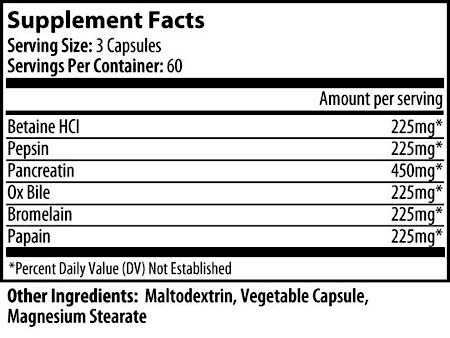 Enzyme Plus contains a combination of Betaine Hydrochloride, Pepsin, Pancreatin, Bile Salts, Papain and Bromelain. Begin by using 2-4 caplets with each meal and adjust to your own daily needs. This product has allowed me to completely get off Nexium, which I had to take because of heartburn. I took Nexium for about 3 years. I could get away with taking 1 pill of Nexium every 2-3 days. The doctor wanted me to take it every day no matter if I needed it or not. Not me, I hated pills but Nexium helped I must admit. Just reading the possible side effects on the prescription was enough to stop me but I needed something to help with heartburn if I did get off it. It also would make me feel weird too. Just about 1 year ago after about a week after starting super enzyme plus, I was finally able to get off the Nexium. This product has done that. I vary between 2-3 pills when I eat and it works every time. Betaine HCL is a non-essential nutrient and a source of hydrochloric acid; a naturally occurring chemical in the stomach that breaks down fats and proteins. Betaine HCL, also called hydrochloric acid and stomach acids, is necessary for the absorption of protein, calcium, vitamin B12 and iron. The low pH of the stomach’s hydrochloric acid allows it to digest any bacteria and micro-organisms that might have been ingested. While human gastric secretions contain many protein-digesting enzymes, the pepsins represent approximately 70 percent of these enzymes. Pepsin is a powerful enzyme that breaks down proteins from food into usable amino acids. Research has shown that HCl levels, liver health, commensal bacteria balance, and healthy stomach mucosal integrity support healthy pepsin production. Pancreatin is a mixture of digestive enzymes that aid in the absorption of fats, carbohydrates and proteins. In healthy individuals, these enzymes are produced in and secreted by the pancreas. Pancreatin is a non-prescription nutritional supplement that contains amylase, lipase and trypsin. The enzymes found in pancreatin each perform a specific function. These functions are all vital to daily digestion and metabolism. The amylase enzyme uses water to break down starches into oligosaccharides, which are carbohydrates composed of simple sugars. Lipase uses water to break down triglycerides into the individual components of fatty acids and glycerols. Trypsin uses water to break down proteins to amino acid groupings known as oligopeptides. Ox Bile helps improves bile secretion which helps ease digestion. Benefits of ox bile extract include a possible reduction of gallstones, greater absorption of vitamin K, A, D and E and may be beneficial in treating liver diseases such as cirrhosis and hepatitis. Pineapple has long been known for its medicinal properties. The fruit and stems of pineapple plants were used to heal wounds and reduce inflammation and pineapple juice was used to cure all stomach problems. When Bromelain was first isolated in 1891, it was found that the stem part of the pineapple plant contained a group of enzymes which had significant medicinal properties. Bromelain is prepared mainly from the juice of the stem of the pineapple plant and is actually a mixture of enzymes. Bromelain stimulates the chemical activities in the body and also helps to digest proteins. Bromelain also has a powerful anti-inflammatory effect. The papaya is a plant native to Mexico and Central America. It is a fast growing herb that bears fruit. The papaya is a pear shaped fruit, rich in Vitamin C, Vitamin A and potassium. Papayas also contain the enzyme papain, a digestive enzyme found more in green, unripe papaya. Enzymes help to speed up chemical reactions in the body. Papain has a mild and soothing effect on the stomach, which aids in protein digestion. with a long track record of assisting people with digestion. (I'm no longer supposed to mention his name on the internet). and it works like magic! (and embarrassing) symptoms associated with indigestion. Take 3 or 4 Enzyme Caps, instead, and Get Instant Relief! If you eat a high-fat meal that takes considerably longer to digest, you require emulsifiers contained in bile from the liver to help the enzyme lipase break down fat. If the liver is at all sluggish or the bile is too thick, this can produce a variety of digestive problems. Taking 3 or 4 Enzyme Caps helps to speed up digestion and protect the digestive tract from the irritation caused by gastric distress. I've been taking enzyme caps for 3 weeks along with No Gerd and it has helped with my digestive problems. I no longer have to take the prescriptions I was told I would have to take for life.